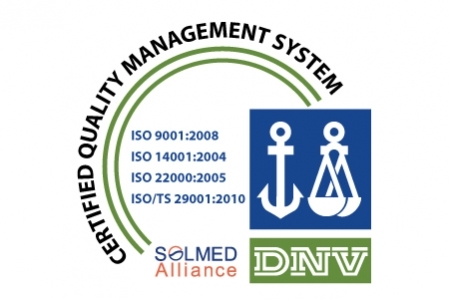 SOLMED Alliance and its members, once again, have surpassed audits made by the organization DNV for granting certificates of ISO 9001 & 14001 standards. This year, DNV has also awarded ISO/TS 29001 to SOLMED. This standard recognizes the optimum developed management for supplying products and services in the petroleum, petrochemical and natural gas industries. During the process, the strict controls of the international standards by certifying company Det Norske Veritas (DNV) have been surpassed and the specific requirements of the new certificate obtained have been fulfilled. The ISO/TS 29001 focuses on processes and customer satisfaction rather than focusing exclusively on procedures. It is an extension of the ISO 9001 Quality Management System standard, but also includes a set of additional parameters specific for the petroleum, petrochemical and natural gas industries. Since 2010, SOLMED Alliance and its members of the alliance have consecutively achieved the most outstanding certifications in the international market in terms of quality and environmental management systems. In addition, SOLMED Alliance performs and exceeds audits periodically as a commitment and guarantee of quality of service. Throughout certifications SOLMED Alliance demonstrates its commitment with safety and environment protection. In this regard, specific plans are developed for controlling and training our employees in the areas of safety, quality and hygiene at work and, at the same time, SOLMED invests in technology to create a business environment with a quality management system more effective, environmentally-friendly and relevant to our customers. For these reasons, once again, the prestigious organization Det Norske Veritas (DNV) has considered that SOLMED Alliance and its alliance members strictly comply with internationally established controls included in the distinguished accreditations ISO / TS 29001, ISO 9001 and 14001. Congratulations to all the staff for the effort made!